We invite you to join Sweet Buffalo Rocks on Facebook! 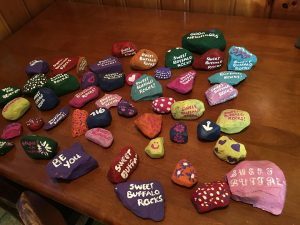 We are painting and decorating rocks to hide in the WNY community and we would love for you to participate! Here’s the link where to find us: www.facebook.com/groups/sweetbuffalorocks. 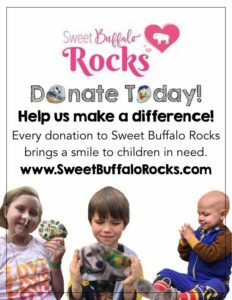 Sweet Buffalo Rocks is now Sweet Buffalo Rocks, Inc., a 501(c)(3) nonprofit organization that raises funds to bring smiles to children in need. If you would like to make a donation to our initiative, you may do so here: www.paypal.me/sweetbuffalorocks. Check out Sweet Buffalo Rocks in the news! What’s the story behind all those painted rocks?